Justice Brett Kavanaugh appeared at oral arguments for the first time Tuesday, where the bitterness attending his confirmation appeared to break, if only a little. Throughout his first sitting, Kavanaugh projected command and interacted warmly with his new colleagues, several of whom were especially lighthearted during the arguments. “We wish you a long and happy career in our common calling,” Chief Justice John Roberts told Kavanaugh at the beginning of Tuesday’s arguments, invoking the construction he often uses when publicly offering well wishes to colleagues. Kavanaugh’s parents, his wife Ashley and their children were also present in the courtroom as was his predecessor, Justice Anthony Kennedy. 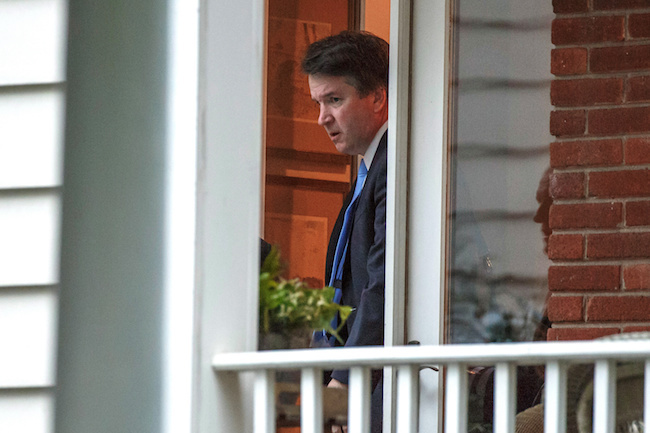 Kavanaugh appeared poised and engaged during the arguments, asking almost half a dozen questions of lawyers on each side during both of the day’s cases. The scenes at the high court on Saturday and Tuesday were a study in contrasts. The indignant crowds that swelled about the court after the confirmation vote saw one demonstrator standing astride the contemplation of justice statue, while others, given over to desperate rage, attempted to pry open the sealed brass doors at the top of the marble staircase while Kavanaugh took the oaths of office at a private ceremony inside. Fear that lingering anger would erupt during Tuesday’s proceedings was palpable, particularly as a court officer delivered the official admonition to remain seated and silent with unusual forcefulness. 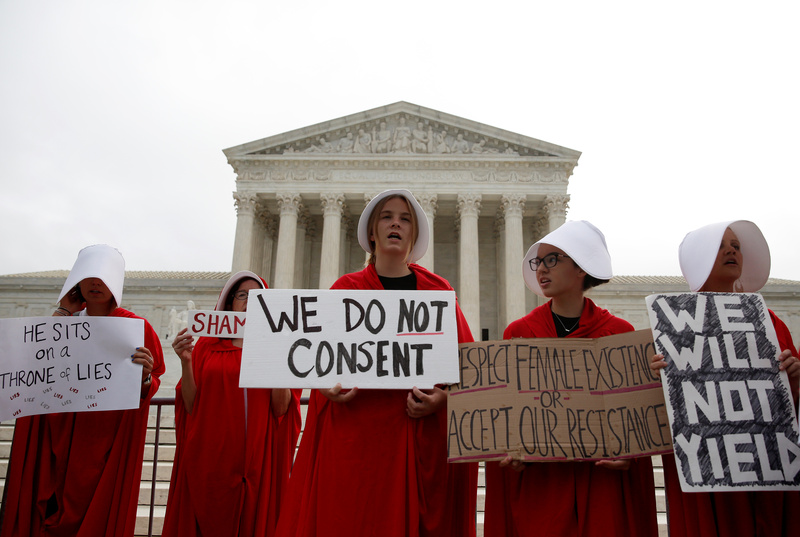 A smattering of protesters, some of whom wore handmaid costumes, demonstrated in front of the court’s marble plaza in the morning. But as arguments began, a genial and orderly mood prevailed. Both cases on Tuesday’s docket concerned the Armed Career Criminal Act (ACCA), a federal law enhancing sentences for repeat offenders that has bedeviled the justices for years. Justice Samuel Alito noted as much in an exchange with a government lawyer during the second argument. The first case, Stokeling v. U.S., concerns a provision of the ACCA that requires a sentence enhancement for criminals with previous convictions for violent felonies. Stokeling asks whether felony convictions under state law that involve minimal force count for enhancement. Alito asked if the ACCA’s definition of “violent felony” reaches shoving, grabbing or pinching. Justice Sonia Sotomayor followed up on this point, turning to her right to pinch Justice Neil Gorsuch, who reacted with good-natured surprise. Later in the argument, an attorney for Stokeling mentioned an opinion Roberts wrote in an April case called Sessions v. Dimaya. “How many votes did that get in Dimaya?” Roberts joked — the opinion referenced was a dissent.